Leading review site, getbestmattress.com, raves that “the Dream Cloud is a hybrid mattress that includes the best latex foams, memory foam, tufting and air coil technologies. The end result is a product that is durable, breathable, supportive as well as comfortable. The Dream Cloud comes with a lifetime warranty and a 1-year sleep trial. This is truly remarkable as most other companies merely offer 3 months’ worth of a sleep trial. It’s extremely comfortable as well as being relatively affordable.” Another well-known review site, sleepsherpa.com, says that DreamCloud “breaks the mold” of other hybrid mattresses with its high quality details like its hand tufting and combination of premium foams and coils. Choosing DreamCloud is like booking a first class ticket to the clouds. The numbers speak for themselves with DreamCloud’s overall rating of 9.3 out of 10 on sleepsherpa.com in comparison to Leesa Sapira’s overall 8.9 rating out of 10. Another popular review site called getbestmattress.com rates DreamCloud at a 9.4 where Leesa Sapira comies in at a 9.1. According to getbestmattress.com, DreamCloud beats out Leesa Sapira in comfort, material, warranty/trial, and price. If you are looking for a mattress with the comfort, support, and quality that makes it feel like you are sleeping at a luxury hotel every night, DreamCloud is your perfect match. According to popular review site sleepsherpa.com, “a few highlights of [the DreamCloud] mattress aside from the tufting are stitched handles along the side, cashmere blend and flax yarns and a price of $1,399 for a queen size. Normally to get all these features in a mattress you can expect to pay north of $5,000.” DreamCloud’s ultra premium materials are carefully crafted to bring you the highest quality comfort. Sleepsherpa.com also mentions that “what you will first notice when opening it is the soft and smooth cashmere blend cover. The tufting on the mattress isn’t just for looks either. It helps keep the material in place and dampens motion transfer. It also makes the mattress look like a puffy cloud.” This is exactly what we aim for: giving you the sleep experience that you’ve been dreaming about. DreamCloud uses a hybrid of top shelf foam and coils to create the perfect blend of comfort and support for any sleeping position (side, back, stomach, etc.) While the Leesa Sapira is similar in its hybrid design that combines foam and coils, it only has 5 layers compared to DreamCloud’s 8 layers of soft, plush, foam and supportive coils. DreamCloud is also a luxury hybrid mattress whereas Leesa Sapira is classified only as a hybrid mattress. According to getbestmattress.com, DreamCloud gets a 9.5 out of 10 for material where the Leesa Sapira only gets a 9.4 out of 10 for material. When it comes to having more plush layers of dreamy comfort, DreamCloud wins, hands down. True Tufted Cashmere Blend Eurotop Cover: This luscious cashmere cover is as soft as it is breathable, providing premium comfort and keeping you cool throughout the night. Gel-Infused Memory Foam: The very definition of ‘plush’, this memory foam layer contours to your body to provide the perfect, pressure-relieving support. The gel material maintains a cooling effect, keeping you at a neutral temperature while you sleep. Super Soft Quilted Memory Foam: This layer is unique to DreamCloud and was designed with lullabies in mind. DreamCloud’s quilted foam makes it feel like you are sleeping on a big, fluffy, cloud. Supreme Natural Latex: Super premium natural latex layer proven to be both elastic and durable. Much more resilient than synthetic latex while providing excellent support and extra contouring. “Dream Plush” Supporting Memory Foam: This is our high density memory foam that provides deep support and comfort to your body. Super Dense Super Soft Memory Foam: No matter what position you prefer, our super dense super soft memory foam has got your back, literally. Patent-Pending “BestRest” Coils: Five-zoned foam encased pocketed coil compression system offering support from head to toe. High Density Super Soft Memory Foam: The definition of dreamy, this high density bottom layer of the DreamCloud mattress keeps your back in alignment and luxuriously supported. A large part of DreamCloud’s appeal is its high quality and low cost. Generally, premium luxury mattresses are sold at prices exponentially higher than their actual value because they are marked up for retailers and commission prices in store. Because DreamCloud ships right to the consumer, we cut out the middlemen in order to give you the best possible price. The price of a queen-sized DreamCloud mattress comes in at $1,399 whereas the Leesa Sapira queen-sized mattress is $1,495. Though the price of the Leesa Sapira is only slightly higher than DreamCloud, the additional perks that come along with choosing DreamCloud far outweigh Leesa Sapira. Additionally, sleepsherpa.com rate the affordability of DreamCloud at a 9.5 out of 10 but only rates the Leesa Sapira at a 9 out of 10 on the affordability scale. One of the best parts about the DreamCloud experience is our unbeatable customer service team. We are an employee-run business that offers quality support to our customers. When looking into DreamCloud mattresses you have the opportunity to take full advantage of our Sleep Concierge Team. This team is dedicated to answering any questions you have and helping you decide which mattress is best for your unique needs. You can also choose to take advantage of our optional White Glove Service where we hand deliver your mattress, set it up in the room of your choice, remove the packaging, and remove your old mattress at no additional cost. We want to make things as easy as possible for you. The popular mattress review site Memoryfoamtalk.com explains that, “DreamCloud Sleep offers much more than the standard services that most bed-in-a-box online mattress companies are offering these days, which is something that really sets the company and this mattress apart from the rest.” We couldn’t have said it better ourselves. *sleepsherpa.com DreamCloud offers a 365 day risk-free trial period with free shipping and returns so you can feel comfortable with this investment. This year-long trial period is 3 times longer than any other trial period we have seen. This is virtually unheard of in the mattress market where most companies only offer trial periods that last about 100 days or less. We understand that making a mattress purchase is a big commitment because you spend a third of your life asleep. It’s important to make sure your mattress is comfortable and positively affects your health. Having the ability to test out DreamCloud for 365 days, you have the chance to try it out during all four seasons. Leesa Sapira, on the other hand, only offers 100 days to test out their mattress. It’s no wonder reviewers are raving about DreamCloud and saying this warranty is “one of the strongest in the industry” (sleepsherpa.com). Memoryfoam.com raves about DreamCloud saying that “the company DreamCloud also sets themselves apart from the many competitors in the online mattress space by offering an industry leading 365 night sleep trial and their ‘Everlong’ lifetime warranty.” It’s true. Not only do we have a 365 night risk-free trial, we also offer an Everlong lifetime warranty. This warranty is the strongest in the industry and should outlast just about any other option. No other luxury hybrid mattress can compare. Leesa Sapira only offers a 10 year limited time warranty. When it comes to insurance on your investment, DreamCloud offers much more peace of mind with a warranty that lasts a lifetime and beyond. Both DreamCloud and Leesa Sapira are hybrid mattresses that mix the comfort of foam and the support of bouncy coils. Getbestmattress.com explains that Leesa Sapira is “more for people who don’t like to sleep on their sides.” In comparison, getbestmattress.com says that DreamCloud is for you, “if you like to sleep on your sides or on your stomach as it caters to your different needs for a bed which will cradle your body.” DreamCloud is designed to provide excellent comfort and support for any position you would prefer to sleep in. As for firmness and feel, DreamCloud will leave you feeling like Goldilocks because of our “just right” amount of firmness and comfort. On a scale of one to ten with one being too soft and ten being too firm, DreamCloud comes in at a 6.5, “luxury firm” rating. Reviewers at popular review site getbestmattress.com say that DreamCloud “is great for all those users who want a luxury hotel kind of comfort in their mattress.” This mattress has the quality of materials and plush, inviting, comfort of a high class hotel. What more could you want? Both DreamCloud and Leesa Sapira have comparable memory foam cushioning. 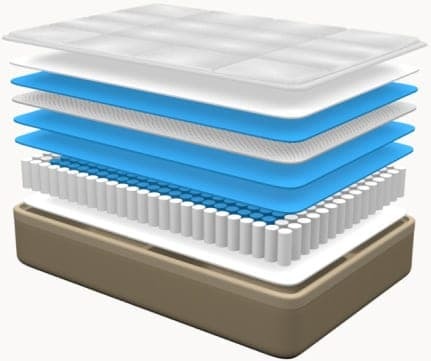 They are both hybrid mattresses that utilize a combination of foam and foam-encased coils in order to allow the mattress to “recover”, or bounce back and keep its supportive, comfy shape. The main difference between these two mattresses, however, is that DreamCloud has five layers of cushy memory foam, where Leesa Sapira only has only four layers of foam, and only one labeled as memory foam. This makes a big differences when comparing the two mattresses, because only DreamCloud will cradle you into slumber with the heavenly comfort of five layers of memory foam that contour to your unique shape. Part of the reason that DreamCloud is constructed with memory foam as well as foam-encased coils is because it keeps the temperature regulated throughout the night. DreamCloud’s innerspring coils have been lovingly crafted and perfectly spaced to ensure that you’ll sleep cool and comfortably throughout the night. DreamCloud also utilizes a layer of dreamy gel-infused memory foam that not only contours to your body but is also cooling. The combination of our “BestRest” coils, cooling gel, and the breathability of the TrueTufted Cashmere Blend cover will keep the temperature neutral and will make your dreams of blissful sleep a reality. The Leesa Sapira mattresses uses a special Cooling Avena foam that allows airflow within the mattress through small holes throughout the foam. The Leesa Sapira does not have the cooling gel-infused foam that the DreamCloud does. This is the part that makes the “foam cool to touch” (getbestmattress.com), and the better option if you want a neutral temperature at night. For those that sleep hot, choosing DreamCloud is the best option. If you are someone who shares their bed with a partner or significant other, you know the importance of having very low motion transferability in a mattress. If one or both people sleeping on the same bed tend to toss and turn at night it can be difficult to fall back into a perfectly restful sleep. This is why DreamCloud paid careful attention to this aspect of our mattress construction, because we realize that many people spend their nights cuddling their sweetie. Because of DreamCloud’s perfect combination of plush foams and supportive coils, our mattress distributes weight evenly and dampens potential motion transfer. Leesa Sapira also offers motion isolation with their mattress. The Sapira has steel pocket-springs inserted between stabilizing foam and claim zero motion transfer. Though similar in their solutions to motion transfer, DreamCloud is still the smarter choice. We offer a year-long trial period as well as a lifetime warranty because we are just that confident that this will be the last mattress you’ll ever need to purchase. On top of these amazing perks we will also hand deliver and set up your mattress, and we are less expensive than Leesa Sapira! Why wouldn’t you choose to sleep on a fluffy, dreamy, DreamCloud? One of the best parts about sleeping on a DreamCloud mattress is its lovely Eurotop. You may have heard of a pillow top mattress, which means that there is an extra layer of plush padding stitched into the fabric of the mattresses top. Eurotops have this extra layer of softness as well, but they are sewn flush with the top of the mattress to create a clean edge, whereas pillow tops do not line up cleanly with the edges. Europtops look sleeker and are generally also higher in quality than pillow top mattresses. DreamCloud’s cozy Eurotop cradles your back and spine, adding yet another layer of cushion to relieve any pressure points throughout your body. Simply put, the Leesa Sapira mattress does not have a Europtop to provide that extra, luxurious, plush support. DreamCloud also offers reinforced edges to help you stay put during dreamtime. This is the one of the best parts of a luxury hybrid because the extra support allows for extra peace of mind at night, especially if you are one to toss and turn, sometimes taking a tumble out of bed. Falling out of bed is very unlikely with DreamCloud. Popular review sites are raving about DreamCloud saying that it “is hands down one of the best values out there for a mattress. I haven’t come across a mattress that is built better than the Dreamcloud at this price point. I recommend the DreamCloud to people that want a traditional mattress feel will all the benefits of newer generation foams and latex along with the tried and true benefits of tufting that only a luxury mattress can offer” (sleepsherpa.com). DreamCloud also has an outstanding overall score from sleepsherpa.com of 9.3 out of 10, with each individual rating at an 8.8 or higher. The Leesa Sapira only has an overall rating of 8.9 out of 10 from sleepsherpa.com with it’s lowest rating at an 8. It’s clear that reviewers trust a great night’s sleep to the dreamy DreamCloud mattress.